SEEKING THE EXTRAORDINARY. SEEKING YOU! The purpose of his page is not to scare you. Quite the opposite. While Haiti has been covered in the media largely in terms of its disastrous 2010 Earthquake, political turmoil, poverty, and epidemics, the country and its people surely are a destination worth your visit. Full of beauty and creativity, the country is home to pristine beaches, glorious mountains and other natural wonders. It bursts with culture and a joy of life that you need to experience. Individual travel in Haiti can be overwhelming, at least for the first-timer. This is your chance to let us take care of you, to explore the beautiful countryside and to learn more about why Haiti is really the Pearl of the Antilles, La Perle des Antilles. Your registration includes all domestic transfers, most food / non-alcoholic beverages, lodging and vehicular support for you and your belongings. We will strive to make this a smooth and seamless experience for you. 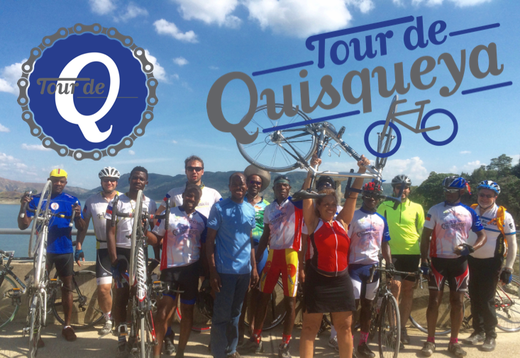 Nevertheless, we ask all registered cyclists to a) sign a liability waiver upon registration, b) understand that this is the second Tour de Quisqueya, and that your participation will help us learn, grow, and improve in years to come, and c) take note of the links below which will assist you in getting packed, prepped, and ready. A suggested packing list will be added to this site in due time. The national currency is the Gourde. The U.S. dollar is accepted everywhere. Exchange services are available in many banks or hotels. The current exchange rate is about 1 USD to HTG 63. Though you do not need shots to go to Haiti. Make sure you are up-to-date on routine vaccines before every trip. These vaccines include measles-mumps-rubella (MMR) vaccine, diphtheria-tetanus-pertussis vaccine, varicella (chickenpox) vaccine, polio vaccine, and your yearly flu shot. It is highly recommended that you wash your hands regularly to protect yourself from any cross contamination. You do not need socket adapters or converters for your standard U.S. electronics. Just as in the U.S., Haiti uses 110 V, 60 cycles, electric sockets.